The tournament website is created automatically as the director goes the setup wizard for the tournament template. The sport, dates, and tournament names are listed at the top. Then the navigation bar takes the user to the following pages: tournament website info page, to register, to view the participants list, view start times, brackets, results, media, event fees, sponsors, map, and hotel. 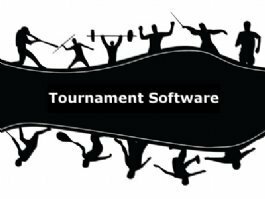 The director can set the tournament website home page message and also upload a tournament logo. When online registration is open, a large Enter Now button will appear. After the entry deadline, this button will disappear. Event sponsors are listed at the bottom of each page on the tournament website. A tournament can have up to 20 sponsors, and they rotate as the user browses to different pages and display four at a time. During a live tournament when the event staff uses the tournament planner grid to assign live courts / fields and to update winners, the home page will list the live matches and show recent results that have been entered.